This is a part-time course offered one (1) full day per week and follows Queensland school term timetable, on a Friday 9:00am to 3:30pm, four terms a year over a two (2) year period. Students will have the opportunity to work with an interstate choreographer each week, this will give students the opportunity to broaden their knowledge whilst making strong industry connections. Students will benefit from Dance Tech’s direct affiliation with some of Australia’s top choreographers, with a strong focus on personal mentoring. The knowledge, experience and personal mentoring that our course will be delivering is second to none in a nurturing and professional environment. Our aim is to guide, mentor and train students whilst placing an equal importance on ALL genres in the performing arts. 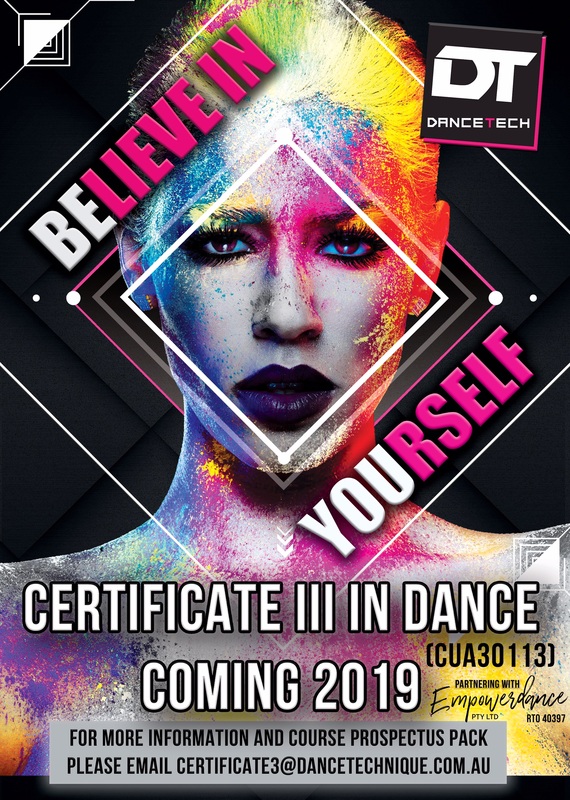 This gives our students the best opportunity to develop into well rounded, highly skilled employable performers with cutting edge choreographic skills and training. Our highly qualified staff have a passion for teaching and our safe family environment allows students to feel supported whilst receiving exclusive one on one mentoring.